I didn’t want to have to hate Chipotle. In college, we were almost like best friends. Their $6-$8 burritos (depending on if I wanted to add the guacamole for $1.80) fed me multiple times per week. It wasn’t uncommon for one of my roommates to eat two burritos in one day. These days, I don’t have the relationship I once did with Chipotle. I rarely eat there, and I don’t even think the food is all that good anymore. I’m definitely not willing to stand in the ridiculous lines that I once stood in for it. It’s pretty much whatever. I don’t feel one way or the other about it. I hadn’t really even thought of Chipotle at all until I noticed Thursday morning that Twitter was mocking the company for putting (very short) stories — from authors like Jonathan Safran Foer, Toni Morrison, and George Saunders — on its cups and paper bags. Twitter’s collective reaction was basically this. I figured that that was just Twitter being its usually snarky self. Who cares what Chipotle puts all over its stuff, right? Well, those were my exact thoughts until I read Safran Foer’s comments in Vanity Fair. 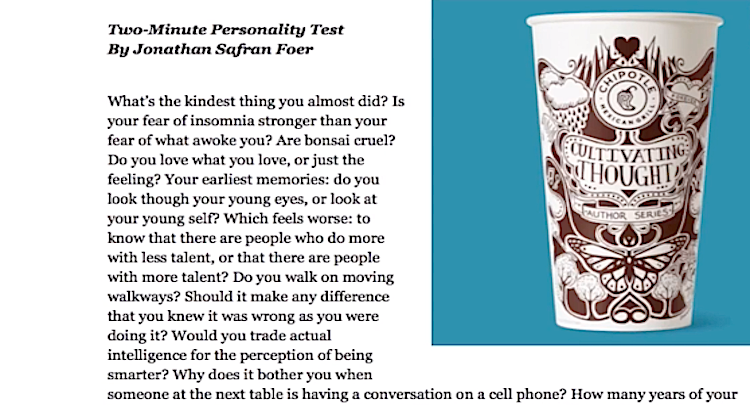 Now, like Chipotle, I’ve never had anything against Safran Foer. I don’t think he’s the best writer out there, and I never could get through Everything Is Illuminated but, again, whatever. And, after reading his quotes (all of which you can find in that link above), I was even willing to ignore that he was shilling for a company that kills animals for us to eat, even though he had written a 352 page book all about why we shouldn’t eat animals. Get that money however you can, Jonathan. But to say that there’s something “democratic and good” about putting a story on a Chipotle cup: How stupid do you think we are? Democratic and good would be writing “please recycle me” on that cup. Democratic and good would be donating some of your money to help keep a library open. Democratic and good would be marching with and/or writing something in support of the fast-food workers protesting for a liveable wage. Next time, just take that Chipotle money and go home. No one will think anything less of you, because we’ve barely ever thought much about you anyway. ♦ Does Anyone Want to Win the English Premier League?